Stringed instruments make sound by the vibration of strings. There are a large variety of stringed instruments from guitars to violins to zithers to harps. String instruments have been a part of music history since ancient times. We know the ancient Egyptians played the harp as far back as 3000 BC or 5000 years ago! There is mention of the harp and lyre in the Hebrew Bible and the ancient Greeks played music on stringed instruments, too. In 500 BC the famous Greek mathematician Pythagoras discovered that when the lengths of different strings were of different proportions to each other, then they would make sounds in harmony. All stringed instruments make sounds by vibrating strings. How the musician causes the strings to vibrate can differ based on the instrument. One way to make strings vibrate is to pluck them. This is how the guitar makes sound when the musician uses her fingers, hands, or pick to pluck the string and cause it to vibrate. Other instruments that are played this way include the harp, banjo, lute, and sitar. Other names for plucking include strumming and picking. Many stringed instruments are played by moving a bow across the strings. The bow is a long stick with some sort of material, often horse hair, stretched across it. The material is moved along the string to create a vibration and sound. 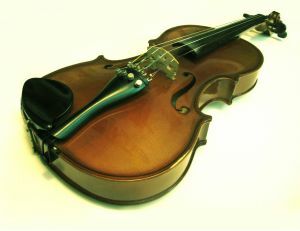 Bow instruments include the violin, cello, and fiddle. Where are stringed instruments used today? Stringed instruments are used in nearly all types of music today. If you listen to pop, country, or hip hop music on the radio you will hear the beat of the bass guitar, strum of the electric or acoustic guitar, violins, banjos, and more. Orchestras all have a string section filled with violins, cellos, and basses. The stringed instrument may be the most popular instrument played in modern music. The string has proven very versatile in creating all sorts of music from the loud scream of the electric guitar to the thump of the bass to the soaring music of violins in an orchestra. Many of the different instruments allow for the musician to express themselves artistically by slight changes or movements to change the tone or volume to express emotion.